For the second-straight year, area alums enjoyed a production from Alabama Associate Professor Seth Panitch. 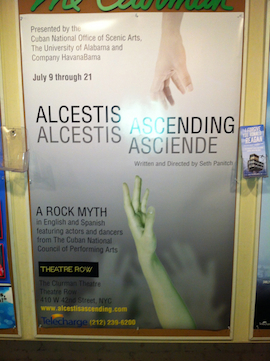 NEW YORK -- Greater New York Chapter members experienced another night of culture this time at the Clurman Theatre for a special viewing of Seth Panitch's play, Alcestis Ascending: A Rock Myth. A group of 15 Alabama alumni enjoyed Panitch's production depicting the historic collaboration between the University and the Cuban National Office of Scenic Arts, followed by post-performance reception hosted by Robert Olin, Dean of the College of Arts & Sciences. "I laughed, I cried and I was completely entertained by what was a wonderful performance," said UANYC President Christopher Hollinger.